Timely and accurate monitoring of gases is critical for many safety, infrastructure, health, maintenance and environmental applications. Technologies currently on the market are too costly, power-hungry, or insensitive for effective distributed deployment. Building on our world-class capabilities in printing and electronics, PARC has developed a sensor system based on low-power electronics and printed transducers to address this need. PARC’s sensors can enable detection of toxic or environmentally harmful gas leaks, monitoring and control of indoor and ambient air quality, and many other solutions. While PARC’s technology can be adapted to a wide variety of gases, to date our efforts have focused on early detection of methane leaks and indoor CO2 concentration monitoring for HVAC optimization. Methane is the principal component of natural gas, an important part of the global energy supply, yet cost-effective technologies for monitoring upstream, midstream, and downstream leaks are unavailable. PARC’s methane sensors can be used for monitoring gas wells, pipelines, compressor stations, refineries, and other parts of the natural gas infrastructure for leaks. They can also detect H2S and other toxic components of natural gas. CO2 is another common and important gas. Excessive levels of CO2 can cause drowsiness, loss of productivity, and adverse health effects. Because of a lack of affordable sensors, buildings are over-ventilated at up to 6X what is required for safety. PARC’s printed CO2 sensors can enable significant energy savings by reducing this waste while maintaining healthy indoor environments. 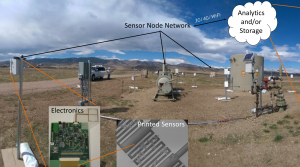 Image: System of Printed-Hybrid Intelligent Nano-Chemical Sensors (SPHINCS): A mesh network of ultra-low-cost printed sensor arrays that can detect natural gas leaks with ppm sensitivity and localize and quantify the leak rate. PARC’s sensors are based on printed arrays of transduction elements comprising chemically modified carbon nanotubes and other carbonaceous materials. Each element is tuned such that the combined array signals provide a fingerprint of gases present. The weak chemical interactions are reversible, enabling continuous sensing. The sensors have been optimized for high performance in real-world temperature and humidity conditions. Customized machine learning techniques, the system can be trained for high sensitivity and selectivity. PARC has demonstrated detection of methane, propane, hydrogen sulfide, ammonia, carbon monoxide, carbon dioxide, and volatile organic compounds. Sensors for many other gases can be developed. PARC’s work includes the first demonstration of natural gas leak detection in realistic conditions on a simulated natural gas well. PARC has developed algorithms to enable leak localization and leak rate quantification based on distributed signals in variable weather conditions. To support the printed gas sensing technology, PARC has developed reliable low power electronics systems. The electronics are designed to be customizable for many network and communications implementations. For distributed leak detection, we have developed a self-forming network that streams data to the cloud for analysis. For indoor environment monitoring, we have a battery-less peel-and-stick self-locating network system. These electronics can be used for testing and evaluation of the sensor system, or adapted for commercial use.